Credit: Spizer Space Telescope. NASA/JPL-Caltech/K. Su (University of Arizona). Shining just 25 light-years from Earth in the constellation Lyra, Vega (false-color infrared image shown) is the fifth brightest star in the night sky. In 1983, astronomers discovered dust orbiting the star, suggesting it had a solar system, and Carl Sagan chose to make Vega the source of a SETI signal in his 1985 novel Contact, though the responsible aliens weren't native to the star: at the time, Vega was thought to be only about a couple hundred million years old, probably too young for any planets to have spawned life. 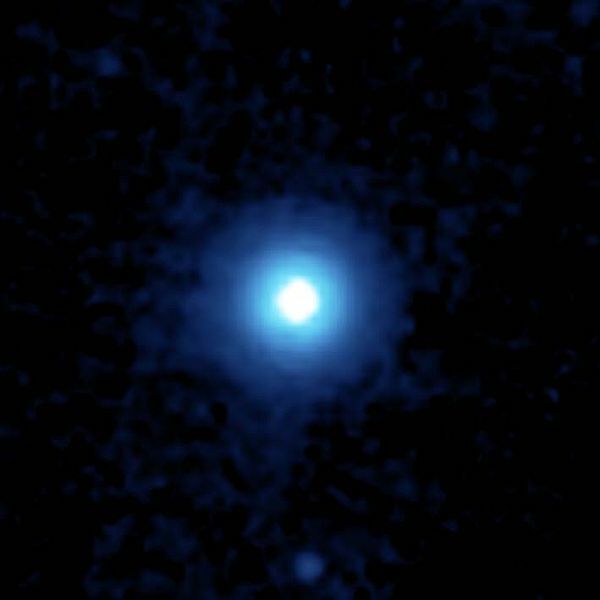 Since then, however, estimates of Vega's age have increased, because astronomers learned that the star spins fast—once every 17 hours—which stirs up the star's interior and forces the surface composition to match the overall composition of the star. This discovery meant that scientists had been overestimating the star's abundance of heavy elements, which in turn meant they had been overestimating its mass—and thus underestimating its age, because less massive stars evolve more slowly. Now scientists have studied Vega with the CHARA interferometer, an array of telescopes in California yielding crisp views of stars, and modeled the observations by using new computations of how fast-spinning stars age. As the researchers will report in The Astrophysical Journal Letters, Vega is 2.15 times as massive as the Sun—agreeing with work from recent years—but considerably more mature than had been previously thought. The star is between 625 million and 850 million years old, so suitable planets have probably had sufficient time to develop primitive life.